The holidays can be extremely expensive. You are out buying tons of gifts and food, driving everywhere, and then buying the tree of course. On top of all of that, there are the Christmas decorations. This includes ornaments, trinkets, and yes, lights. A lot of lights. Around the holidays, almost everyone sees their electric bill spike, which can put a serious damper on the holiday spirit. However, there is an answer to at least one of your problems: the best solar powered Christmas lights. Now you may be thinking, how are these even a thing? There is no way these could work. Well, you may be a bit surprised. Think about it. Not a lot of people leave their Christmas lights on 24/7. They are really only worth turning on at night. The great thing about solar powered Christmas lights is that while they are off during the day, they are charging for their night shift. We have looked through a lot of Christmas catalogs and found the best solar powered Christmas lights that can save your holidays. After lots of holiday stress... Here are the best solar powered Christmas lights. 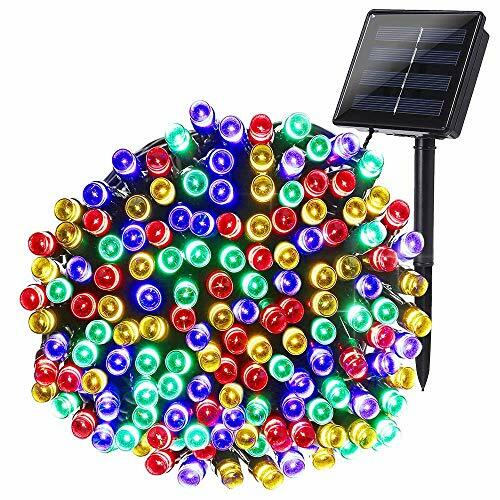 In the chart below, you will find our top 10 rated Best Solar Powered Christmas Lights. For a more in-depth review of each model, please click on "Read Review." 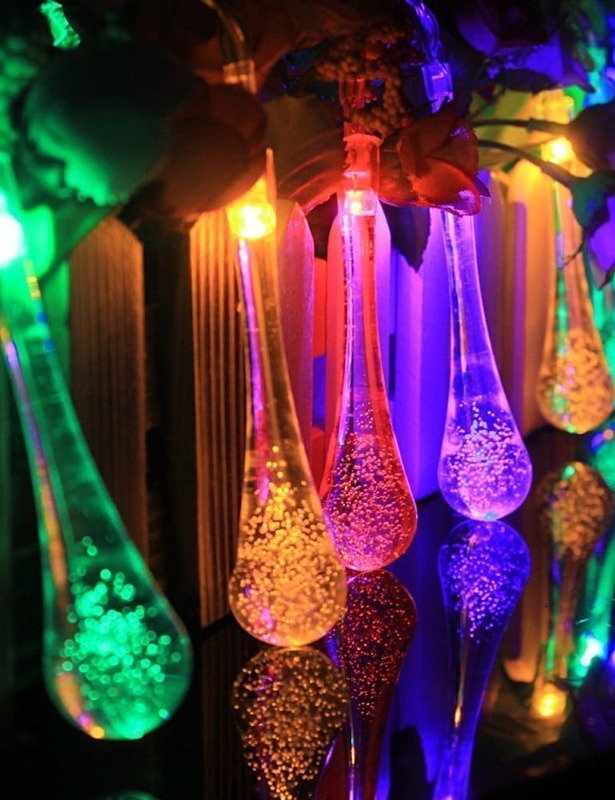 After lots of holiday stress....Here are the best solar powered Christmas lights. What Are Solar Powered Christmas Lights? Outdoor holiday lights are all basically the same, it is just the design that changes. With solar powered Christmas lights, the only difference is that instead of plugging them into your house's outlets, they charge by sunlight. With solar Christmas lights, a solar cell and battery will be on the end of the string of lights, typically where the plug would be. That solar panel can be put anywhere, whether it is mounted on a wall or placed in the ground. For those who actually care about the science behind solar lights, it is quite simple. Photovoltaic cells are what absorb the sun’s rays during the day. Those cells convert the rays into usable energy, which the rechargeable batteries then store. The photoresistor is what detects the presence of light. When there is not any sunlight, the outdoor lights will come on. Overall, the power comes from the control circuit board, which send the power to the LEDs when the photoresistor indicated that there is no light. This is one of the biggest advantages of solar Christmas lights. There is no need to turn them on every night. Besides, unless your lights are on a timer, this is something that is probably always in the back of your mind. The best solar powered Christmas lights will be able to do all of that perfectly and more. The conversion of Christmas lights from hardline to solar power is really the only thing that changes. You can buy these lights in any number of styles, colors, sizes, variations, and lengths. When you are searching for the best solar powered Christmas lights for you, there are four main types that you will find. The most common one you will see is the chain or string lights. The other main types include stake lights, figure-shape lights, and lamps. Each of those types come in many different styles. 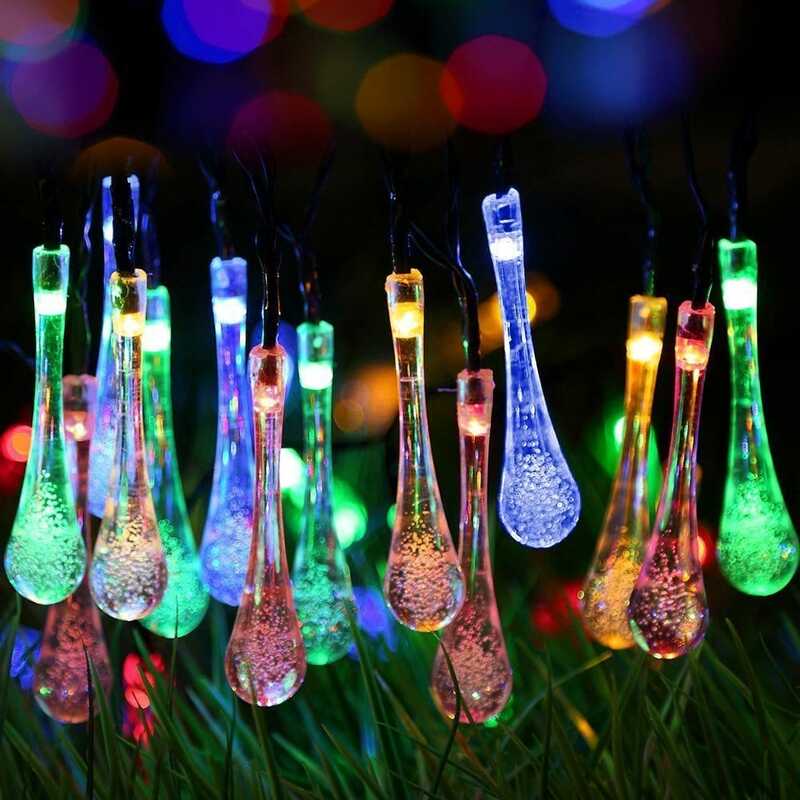 For example, you can buy solar string lights in the shape of icicles that can hang from your roof or windows. Now, of course, you can mix and match any of these types that you want. Each has a specific purpose, but you can place them anywhere on your property to give more excitement to your Christmas decorations. 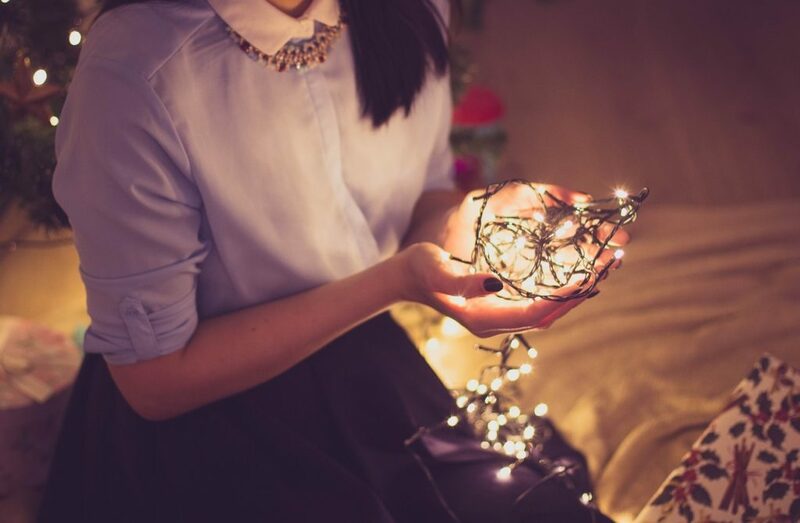 For example, string lights are perfect for bushes, around the border of your house, doorways, and etc. On the other hand, stake lights are good for enhancing the light on your lawn or driveway. You are free to be as creative and crazy as you want. Solar powered Christmas lights are a great way to save some money over the holidays while expressing your creativity to the max. In fact, more and more people have been switching to these solar lights in the past few years. In response to the increase in demand, manufacturers have begun producing all types of solar Christmas lights. In fact, they produce so many that it can be easy to get overwhelmed and confused. The biggest issue for consumers is trying to determine which ones are the best quality. Here are some things to be on the lookout for when trying to find your best solar powered Christmas lights. 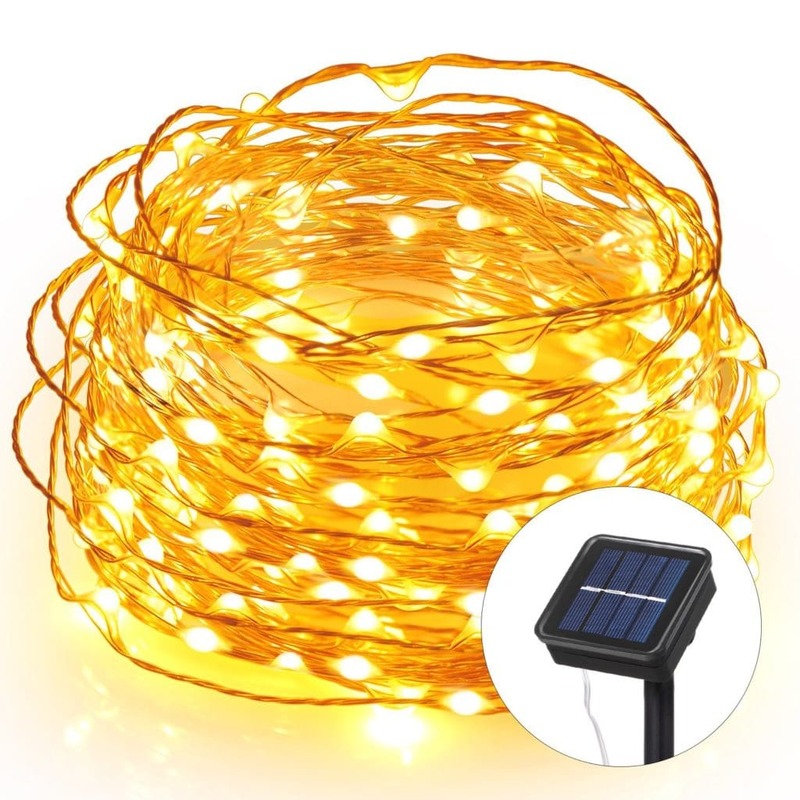 There are many cheap brands of solar Christmas lights out there. With that in mind, a lower price tag usually comes lower quality. This could mean that the company cut some very important corners. Since winters have been very weird lately in terms of climate, it is important that your outdoor lights function well in whatever weather that may come your way. Some solar Christmas lights are not UV resistant, meaning that continual exposure to heavy sunlight can cause the plastic components to break down. Look for lights made from UV resistant nylon material. In addition, lower quality solar Christmas lights typically do not have a way to conserve power on very cloudy days. Once the rechargeable batteries run out and there is no sunlight to recharge them, the lights will not work. However, high-end brands have a power preservation mechanism to conserve energy when the sunlight is scarce. When it comes down to it, there are two things to look for: lights that work in high and low climates and ones that have a power reserve. In general, one of the most annoying things when it comes to solar lights is worrying about the solar panel. You may worry if it will get damaged from the snow or rain or debris. Most of the best solar powered Christmas lights have their solar panels made with tempered glass. This is the same stuff they make the best smartphone screen protectors with. Tempered glass can protect the panel from scratches or any other form of damage that could threaten the integrity of the functionality of the lights. However, the cheaper brands tend to just put a plastic coating over the panel which can break down over time, which causes the panel to be less efficient. Ultimately, that can affect the output and ability to recharge the batteries. In summary, be sure that the lights you choose have a tempered glass protector over the solar cell panel. This one is pretty important because you probably want your lights to be on and bright for most of the night. 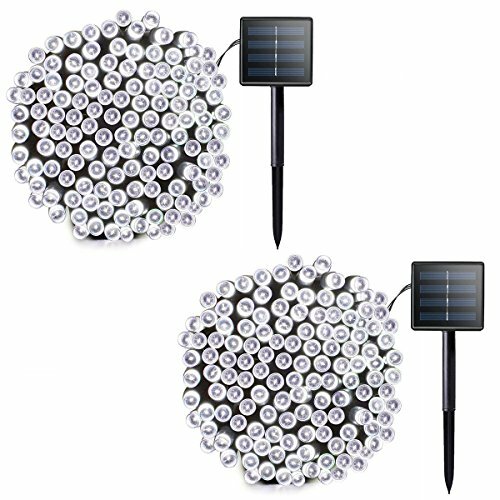 Many of the lower quality solar lights tend to get dim within a few hours and take a long time to recharge. The best solar powered Christmas lights will stay bright and only take about eight hours or less to charge. While a lot of the brands will claim this feature, it is best to just check the customer reviews. 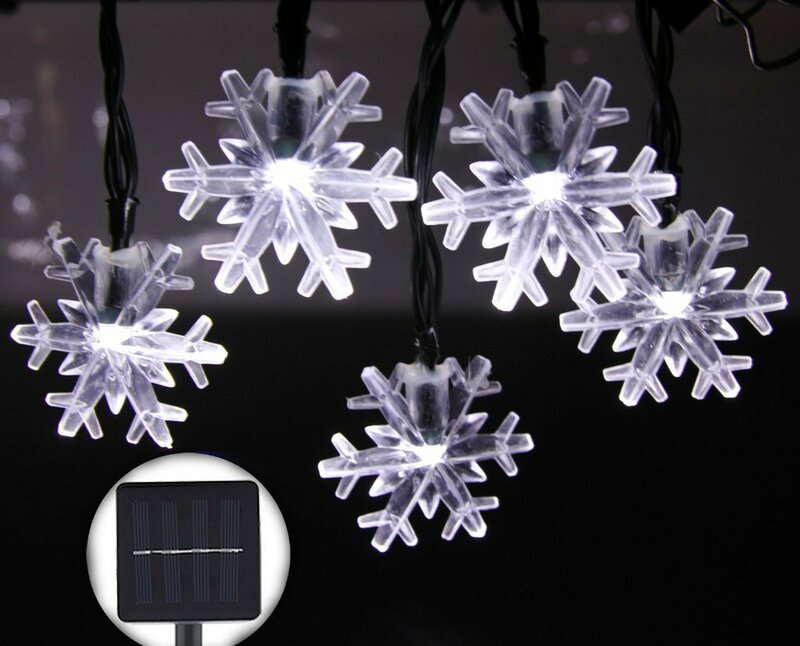 Better yet, check out our full reviews of each of the top 10 solar Christmas lights. That way, you can rest assured that you are getting a good quality Christmas light. Another good way to check the efficiency of the lights is to check the battery temperature range. This is the temperature at which the battery stays operational, as well as the peak wattage of the panel. Thankfully, most of the temperature ranges have a wide range, around 0 to 120 degrees Fahrenheit. This is definitely something to look out for. The customer reviews and ours will give you the facts, as well as the cons of each light in a language most can understand. Purchasing string lights with 100 LED lights may sound like a lot, but when you actually get around to decorating, 100 does not go very far. Many of the lower quality brands of lights only come in strands of 100. While they may be a bit cheaper, you'll have to buy multiple strands. Look for string lights with 200 bulbs or more. You'll thank me later. 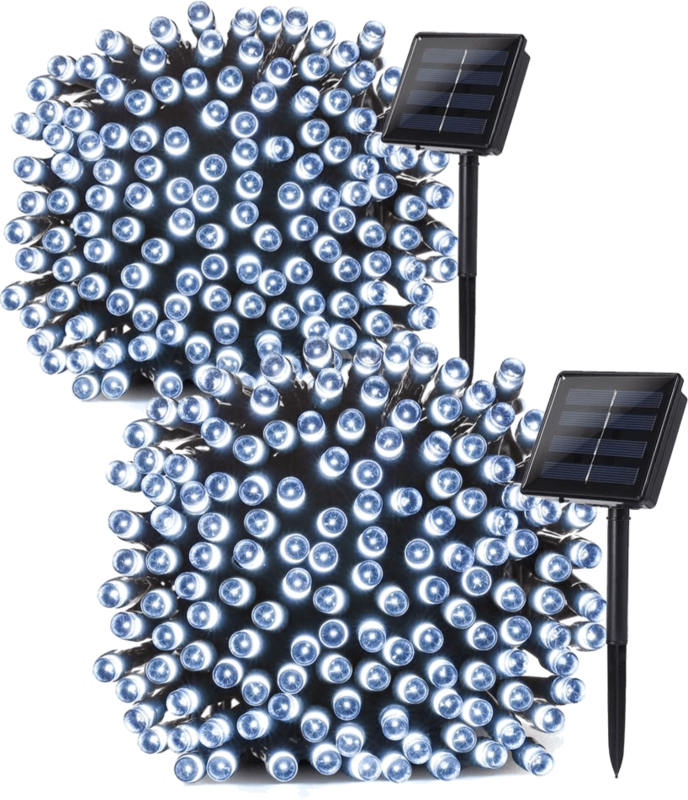 Lately, brands have started to make solar Christmas lights with replaceable LED bulbs. This is really to help the consumer because many do not buy new lights every single year. In my household, we have had the same lights for nearly eight years or more. Now, even though LEDs last incredibly longer than the old incandescent lights, sooner or later they will burn out. Instead of going out and buying a whole new string of lights, it is easier and cheaper to just buy replacement bulbs. In addition, sometimes you may unravel your string of lights to find that a few odd bulbs have gone out. It will be better to just replace them instead of having to buy a whole new strand. News flash people: anything outside during the winter is bound to get wet when it snows or rains. If you went the cheap route, your Christmas lights may not be water resistant. This means that your winter wonderland is about to get a whole lot less mystical. 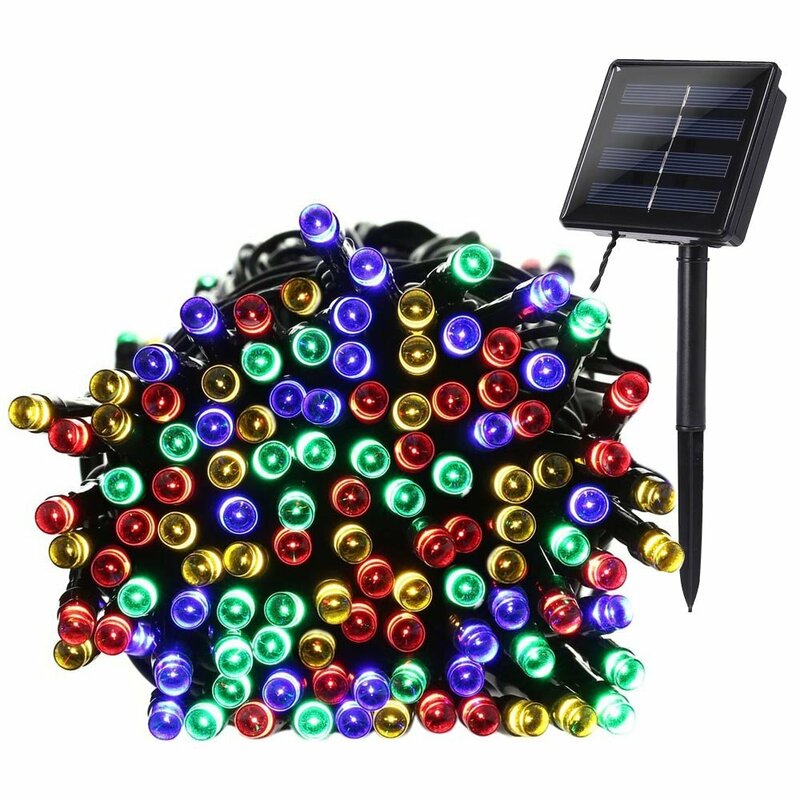 Be sure that when you are searching for the best solar powered Christmas lights, they are either waterproof or highly water resistant. Meaning they will have fully gasketed and tightly sealed components. This includes the switches, connections, LED bulbs themselves, and of course the solar panel and battery. You can buy these lights in any number of styles, colors, sizes, variations, and lengths. When you are searching for the best solar powered Christmas lights for you, there are four main types that you will find. The most common one you will see is the string lights. The other main types include stake lights, figure-shape lights, and lamps. Each of those types come in many different styles. This one is probably the most popular and common form of Christmas lights on the market. 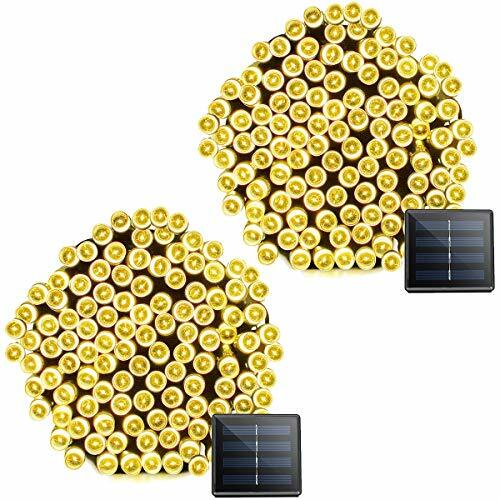 Often called outside solar fairy lights, these lights are simply a string of lights with a solar panel on the end. String lights by far have the widest range of applications and creativity available. When buying these lights, you may find two different sub-types. The standard chain lights or the net lights. The chain is what most people use, while the net is literally a large mesh network of cables and lights. Net lights are perfect for covering bushes or wrapping around trees outside. On the other hand, chain lights are more for lining the border of your roof, doorway, and deck railings. However, chain lights can be used as net lights because you can wrap them around bushes, trees, or basically anything, as long as they are long enough. Whether you want to line your lawn with Santas, snowflakes, stars, or angels, these lights have got you covered. These figure lights are the best solar powered Christmas lights for enhancing the magic of your deck, front lawn, porch, or even garden. They are basically re-purposed pathway lights, as the Christmas figures are placed over the LED bulbs which are on stakes. Simply shove them in the ground, in an area that allows for sufficient sunlight, and you are good to go. Since they are not connected by a cord and are completely self-sufficient, you can place them wherever you want. The last type of solar Xmas lights is the decorative lamp. These are purely for aesthetic purposes, more so than the other because they really do not produce a lot of light. The most popular form of these lights are the candle lights. They produce a soft glow that is perfect for creating a picturesque winter landscape. The best quality lamps tend to last for hours with a short recharge period, due to their size. They can come in many different theme designs, including a porcelain or glass bowl of various colors and design patterns. Think of the Christmas version of a jack-o-lantern. From looking at all of the solar holiday lights, there are a few features that they all share. Be on the lookout for these features when shopping. Waterproof. You should not need to worry about them in snow or rain. Multiple modes. This means that you can physically switch them to on, off, or auto. High quality wiring that will not break or get damaged from extended use. Temperate glass protection over the solar panel. A lot of people are still new to the whole solar power idea. Here are some questions others have asked when looking for the best solar powered Christmas lights. 1. What are the advantages of solar Christmas lights? There are a lot of advantages that solar powered Christmas lights have over the hardline lights. They do not require to be plugged in anywhere, meaning you can place them basically anywhere you want. There is less of a risk of fire, due to the fact that they run cooler because they require less energy. Not to mention, LED lights last far longer than the traditional incandescent bulbs. Plus, they are eco-friendly and greatly lower your electric bill! 2. 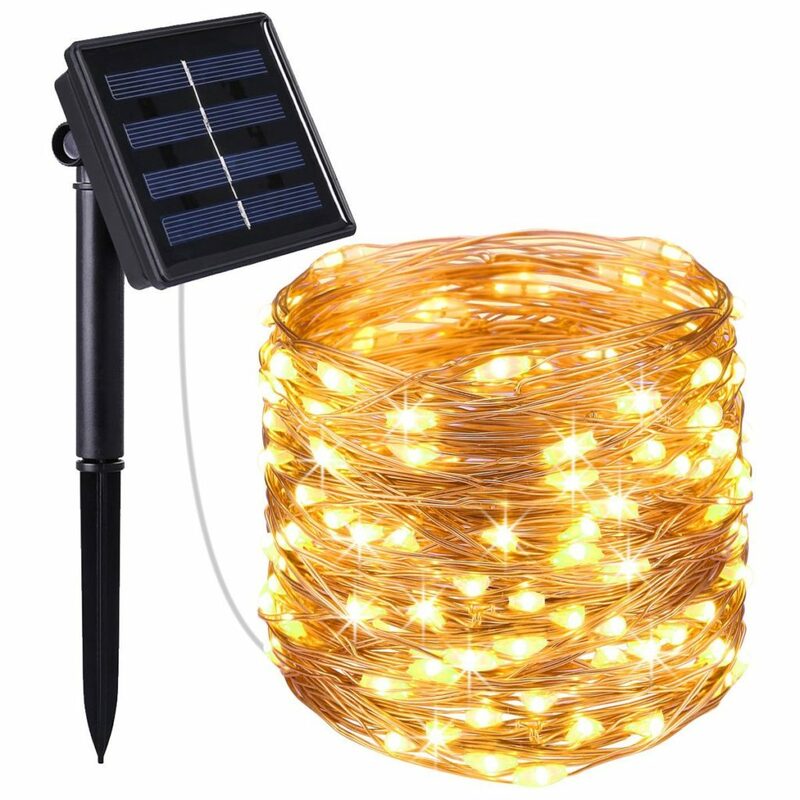 Are there any disadvantages of solar string lights or other types? 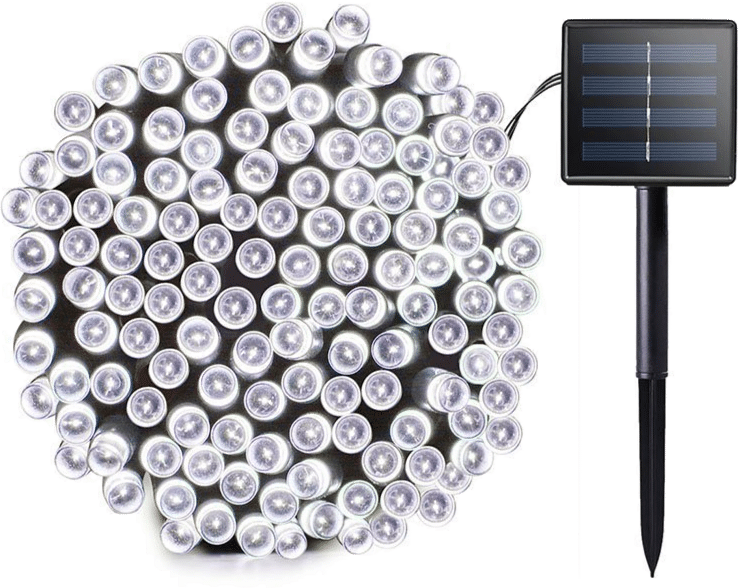 The biggest issue against solar lights and solar in general is the price. They tend to have a higher price tag than traditional holiday lights. However, the higher price is made up for in the savings you receive on your electric bill. Other than that, they obviously need access to plenty of sunlight and if the weather is crumby, they may not function as well. 3. How long do these lights stay on for? The short answer is that they stay on for as long as they charged for. If they absorbed eight hours of sunlight, they will stay on for eight hours. Five hours of sunlight means five hours of functionality. Typically, if they have adequate sunlight throughout the day, they should last for eight or nine hours. It all depends on the availability of sunlight. 4. Do they need direct sunlight? Thankfully, they do not need direct sunlight. 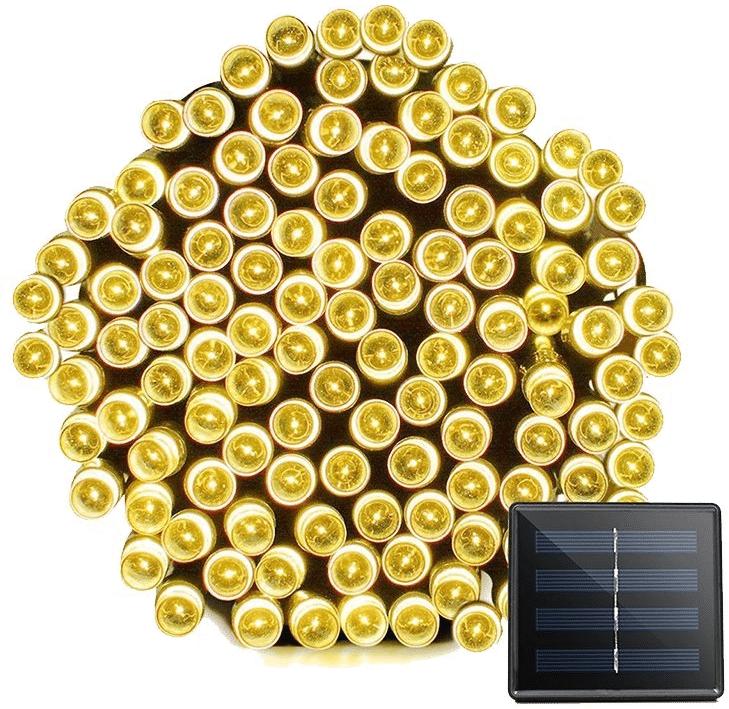 The modern solar panels are able to absorb solar energy even on cloudy days, and this technology is included on the newer solar Christmas lights. Of course, they will function better on bright, sunny days, but they will still function on cloudy days. Just do not place them in areas that usually get more shade than sun and you should be fine. I have shown you the brightest solar Christmas lights, solar garden fairy lights, and solar-powered LED Christmas lights. Hopefully, with this information you can choose the best solar powered Christmas lights for you and your ideas. Be sure to check out the individual reviews for each solar light we have featured here.